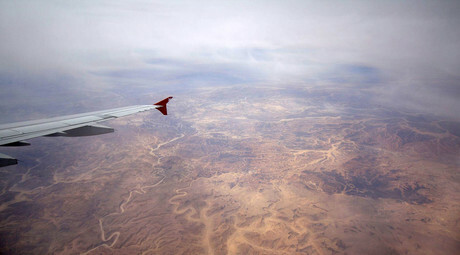 The nature of passengers’ injuries from the Russian jet that crashed in Egypt’s Sinai on Saturday may indicate that an explosion took place aboard before the plane hit the ground, an Egyptian doctor who examined the bodies said, Sputnik news agency reported. "A large number of body parts may indicate that a powerful explosion took place aboard the plane before it hit the ground," an Egyptian forensic expert told the agency. 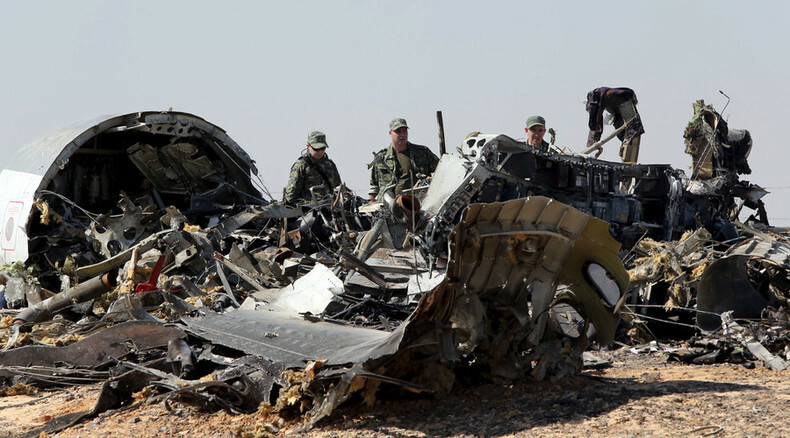 A DNA analysis would be required to identify the victims of the Russian A321 airliner crash in Egypt, the expert added. According to the broadcaster, they were diagnosed with burns of over 90 percent, with experts noting particles of metal and aircraft covering piercing the bodies of the deceased. The people in the front part of the plane died from different causes, including blood loss, shock, open head injuries and multiple fractures, it added. However TASS news agency cited Russian and Egyptian experts as saying that they failed to find any blast-related trauma during their preliminary examination of the bodies of the victims. “There were no signs of an explosion impact found during the preliminary examination,” the source said. One of the Egyptian experts also told TASS that “there were no signs of external impact” found on the bodies. There have been no official announcements made so far on the results of forensic medical examination of the crash victims. An unnamed US official said on Tuesday that before the Russian passenger airliner crashed in Sinai, an American infrared satellite had detected a heat flash in the same vicinity, indicating that an explosion may have occurred onboard. “The flash, which was observed by the satellite, that’s a piece of evidence, but against it’s inconclusive. It can also occur if there was a missile attack, a fire onboard or an explosion onboard,” retired flight commander, Sultan Mahmoud Hali, told RT. Dr. Anil Padhra, a senior lecturer in aviation studies at London’s Kingston University, told RT that examining the passengers’ injuries might not be the most precise way to learn about the reason for the crash. “It’s too early to say categorically whether or not the plane broke up in the air. It’s difficult to tell what the injuries would have been if there was an explosion onboard. And I think it’s difficult to tell how it would be different to injuries sustained when the bodies impacted the ground,” Padhra said. Dr. Padhra also mentioned another theory, which has been discussed as widely as others, saying that a midair collision could have interrupted the Airbus A321’s flight. There is a “possibility that the aircraft could have collided with some other object – I’m thinking, in particular, unmanned aerial vehicles or drones may have been operated in that area to gather intelligence by different authorities… We know it was a conflict area. We know that drones can achieve that kind of altitude,” he said. All 224 people aboard were killed, making it the deadliest civilian aircraft disaster in Russian and Soviet history. Since the crash on October 31, several possible causes of the Sinai tragedy were discussed by experts. Islamic State (formerly ISIS/ISIL) attempted to claim responsibility for the incident, saying that it brought the plane down as retaliation for Russian air operation against the terrorists in Syria. However, many experts rejected the claim, saying that the jihadists only possessed man portable air defense systems with no capability to reach the high-flying Airbus. An explosion of a bomb aboard the plane was mentioned as another possible cause of the crash. 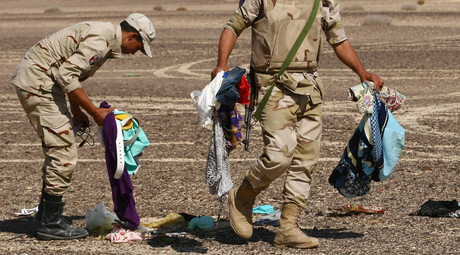 US global intelligence company Stratfor said that Egyptian security personnel often take bribes for allowing passengers to avoid checks, with cargo security screenings in the country also not being strict enough. There was also speculation that corrosion of parts of the plane could have caused the crash, backed by claims that the Russian airliner broke up in the air. However, Egypt’s civil aviation ministry said on Tuesday there are no facts to substantiate assertions that the plane really fell apart in the sky. The journalist also found out that the Airbus A321 struck its tail on a runaway during an unsuccessful landing in 2001. It was later repaired, but some experts believe the lasting damage could have causing the crash in Egypt. Human error was also mentioned among the early explanations for the incident, but this was quickly rejected. “It normally takes four to five weeks to examine the contents of the black boxes because it’s a technical process,” he added.